Rory McIlroy is set to earn his father a massive pay-out from Ladbrokes should he be seal the deal this afternoon at Royal Liverpool and be crowned the 2014 Open champion. Ten years ago, Rory's father, Gerry, was so confident in his son's chances of future success that he put his money where his mouth is and bet £200 on young Rory winning the Open within the next ten years at odds of 500/1. He will, therefore, collect £100,000 should McIlroy Jnr get his hands on the Claret Jug later this afternoon. Two friends of Gerry also placed similar bets, which will see them collect £80,000 in winnings from Ladbrokes. Jessica Bridge of Ladbrokes said: "As the family celebrations get underway, there'll be an extra bottle or two of bubbly courtesy of the bookies. This is the most expensive Open result since Tiger's heyday in 2006 but, although we're facing heavy losses, we can't help but admire the foresight of Rory's dad and his pals a decade ago." Rory stands to pocket a cool £945,000 for his four days’ work. She added: "It's not the first time a famous parent has taken us to the cleaners. Lewis Hamilton's family and friends cashed in from bets placed when the F1 star was just nine-years-old." 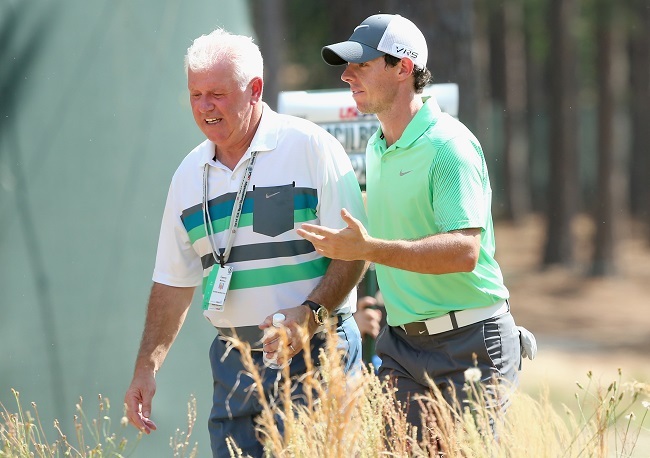 Rory wouldn’t do too badly out winning his third major championship either. He stands to pocket a cool £945,000 for his four days’ work. That’s £45,000 more than Phil Mickelson pocketed when he won at Muirfield last year. A win would take Rory past the €19m in career prize money on the European Tour and beyond the $18m mark on the PGA Tour career money list. He is currently 11th and 64th on each list respectively. McIlroy is the hot favourite to win today, holding a six-shot advantage over nearest challenger Rickie Fowler. Rory McIlroy :: Can he do it? Can you see anyone overtaking him or is Rory McIlroy going to lift the Claret Jug tomorrow night? How do you see the final round panning out? Leave your thoughts in our ‘Comments’ section below.